Comebacks are never easy, especially in the NBA. However, a former Lakers center is trying to make it happen. Andrew Bynum is working out and trying to find his way onto an NBA roster. Earlier this week, Shams Charania (of The Athletic) sent out a tweet regarding Andrew Bynum. Charania tweeted that Bynum has hired representation in an attempt of a comeback. He is also scheduling team workouts before training camps. Andrew Bynum last played in 2013-2014. He played a total of 26 games with two different teams. He played with both the Cleveland Cavaliers and the Indiana Pacers. The Cavaliers signed Bynum in the 2013 off-season. They signed him despite the complications with his knees. His knee injuries prevented him from playing with the Philadelphia 76ers, which was the team he was traded to in the 2012 off-season. The Lakers agreed to a four-team trade that sent Andrew Bynum to the 76ers and Dwight Howard to the Lakers. Dwight Howard stayed with the Lakers for only a year and Andrew Bynum did not play a single game for the 76ers. Bynum played 24 games with the Cavs before they traded him. He was suspended by the Cavs for conduct they deemed "detrimental" to the team. The "detrimental" incident happened in practice. Bynum was thrown out of practice because he shot the ball every time he touched it. In other words, he was shooting from any and everywhere on the court. The Cavs suspended him and later traded him to the Chicago Bulls. The Bulls traded Luol Deng in exchange for Bynum, but the Bulls waived him the same day to clear cap space. After he was waived, Bynum signed with the Indiana Pacers. Bynum played two games with the Pacers before they announced that he would miss the rest of the season. This was the last time Bynum played in the NBA. While a comeback won't be easy, Bynum is trying to get himself ready. Although he is 30 years old (and turning 31 in October) and has a history of knee injuries, he could easily help a team in many ways. However, which team could he be of help, is the question. Shams Charania sent out another tweet about Bynum. He said that Bynum is working out at the Lakers' facility. It isn't a workout, but it is still an opportunity for him to showcase/get ready. Sources: Former Los Angeles Lakers champion center Andrew Bynum worked out in the Lakers' facility this week as he pursues NBA comeback. Not an official Lakers workout, but gave Bynum opportunity for open gym runs. Bynum's best season was during his time with the Lakers. In the 2011-2012 season, he averaged a career-high in both points and rebounds. He averaged 18.7 points and 11.8 rebounds in 35.2 minutes (another career high). Bynum was also an All-Star that year. He is also a two-time champion with the Lakers. He won a championship in 2009 and another in 2010. If the Lakers give him an official workout, I could see a deal coming into fruition. 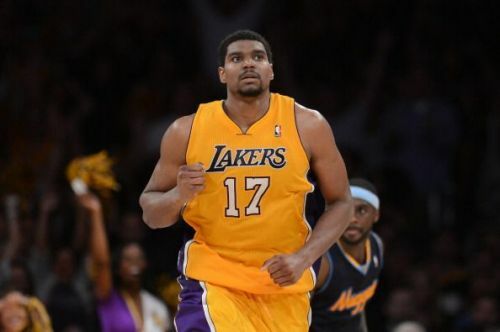 If it is for the right price, Bynum could come off the bench and contribute to the Lakers. If the Lakers aren't interested, there could be other teams who would be interested. As long as Bynum is healthy, he should be considered. Will he be the Andrew Bynum the Lakers once had? No. But, if given the right opportunity, he could be productive, for sure.